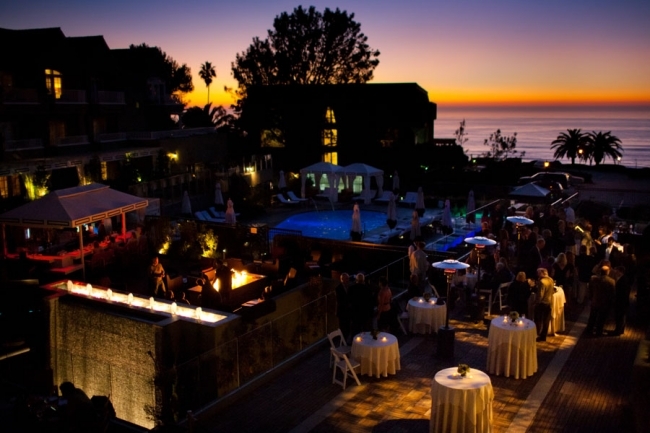 The upscale resort L’Auberge in the heart of Del Mar is a favorite wedding venue among San Diego wedding photographers, known for sunsets, ocean views and sophisticated hospitality. This venue is convenient for beach weddings or events on one of their on-site terraces. It also happens to be home of Kitchen 1540, one of the top restaurants in Del Mar. There are three different photogenic locations for wedding ceremony sites here – Seagrove Park, Powerhouse Park or the sunset terrace at L’Auberge. The sunset terrace has views of the ocean and is on the L’Auberge property. Seagrove Park and Powerhouse park are grassy del Mar gems right on the beach and both require a permit. One of the reasons why L’Auberge is so popular for weddings is that you can host a high-end outdoor wedding reception at an upscale resort and have amazing views of the ocean the entire time. On clear days, L’Auberge is a perfect place to enjoy the sunset and watch the surf. L’Auberge can accommodate weddings of most sizes and has everything from smaller rooms, open-air terraces and a ballroom. The Pacific Terrace is up high with good views, can hold up to 400 people and is particularly good for photography. Even if you choose not to have a beach wedding, the beach is less than a block away from L’Auberge for taking portraits. You could do family portraits at Seagrove Park and then head for the sand for couples’ portraits when the lighting is perfect late in the day.